Show your love for Greater Des Moines! Volunteer for an upcoming event and help us make visitors feel welcome. We are always looking for individuals who have enthusiasm for the city and enjoy connecting with people. Help visitors have a great experience while in Greater Des Moines by answering questions, giving directions, or providing helpful information. Complete the form below to receive information regarding upcoming Greater Des Moines volunteer opportunities. By checking yes I am giving permission for Catch Des Moines to send me email regarding volunteer opportunities, and I understand that I can unsubscribe from at any time. To receive the latest volunteer opportunities that go on in our community, you must register to our mailing list. Please check all that interest you below. Catch the events that come to town and pop! Be part of the action… on the volunteering side of things. Catch all the politics right here in Des Moines and volunteer with the Secret Service (well, maybe not quite, but you never know). Catch all the locals putting on some pretty cool events right here in our very own neighborhoods and help them make their event a success! Catch the groups that chose Des Moines as home for an event, conference, convention or outing where they need all hands on deck. Catch the volunteer opportunities around events that bring views and beliefs to our city. 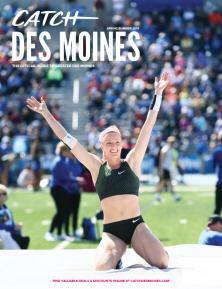 Catch some time with the athletes when Des Moines hosts some local and national sporting events. Need help finding volunteers for your event? Help visitors catch everything Greater Des Moines has to offer! We are looking for volunteers to staff our information kiosk at the Des Moines International Airport. This is the perfect opportunity for those who enjoy meeting new people and talking about the city. Volunteers are expected to greet visitors and answer questions about local restaurants, hotels and attractions. The information kiosk is open 9 a.m. – 5 p.m. Monday through Sunday. Whether you are looking for a weekly four-hour shift or just want to be a substitute, we want you to join our team!